SCVHistory.com | Saugus | High School's Gas Lines Replaced Due to Bovine Corrosion, October 1979. Saugus High School's Gas Lines Replaced Due to Bovine Corrosion. October 1979 | News Reports. The Green Pastures Dairy Farm occupied the future Saugus High School location from about the end of World War II until February 1969 when the William S. Hart Union High School District bought the property. 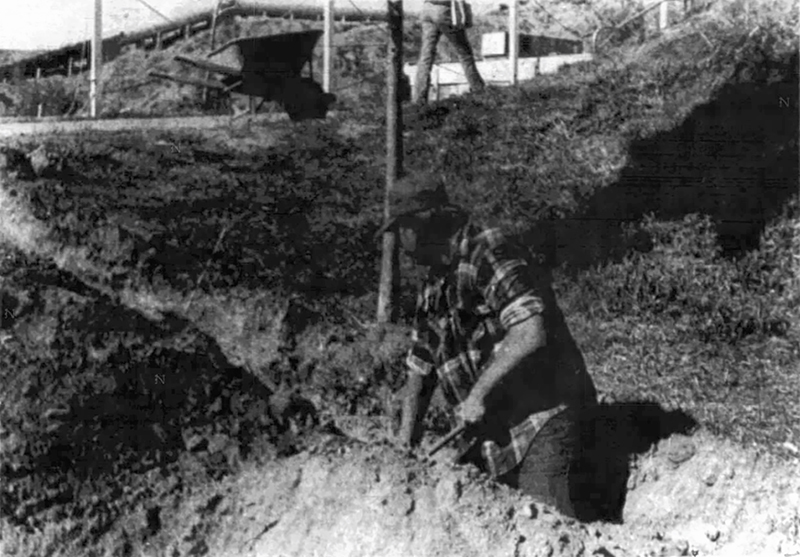 Groundbreaking for the school occurred October 24, 1973, and it opened September 6, 1975. Above: A workman replaces corroded pipe at Saugus High School. Photo by Marshall LaPlante/The Signal. Click to enlarge. Cows' Leavings Ruin Gas Pipes. The Signal | Wednesday, October 24, 1979. Maybe cows do their best for Jerseymaid but they sure didn't help Saugus high school. The four-year-old school, which was built on land once used as a dairy, is now in the midst of a "major crisis," according to Hart district assistant superintendent Dr. Ed Fickenscher. He said that virtually all of the campus' gas lines will have to be replaced, at a cost of "many thousands of dollars," due to corrosion of the pipes. The cause of the corrosion has been attributed to the leavings of the former tenants of the property. A soil corrosion engineer hired by the district to investigate the problem has found that the soil is rich in acid derived from animal wastes. Dr. Fickenscher pointed out that although the excrement has been beneficial to the school in the form of fertilizing the football field, animal urine was the major cause of the pipe corrosion. The problem surfaced on October 3 when a minor gas leak was detected in the vicinity of E building. The school's gas service was shut off and the leak quickly repaired. But when the line was tested, as required by law, by pumping compressed air through it, additional leaks were discovered. The district replaced 260 feet of gas line, but when the line was air tested again, still more leaks were found. An additional 500 feet of line was replaced last Saturday, and the system still couldn't hold up under the pressure test. Part of the problem, Dr. Fickenscher said, was the district's inability to "isolate" exactly which sections of the line were leaking. Valves had to be welded into the line so that the district could pinpoint the trouble spots. This led to the discovery that the line was corroded in so many places that virtually the whole system had to be replaced. Dr. Fickenscher said that to order to establish a "large margin of safety," the gas line was tested at 90 pounds of pressure even though gas is normally pumped through the lines with only five pounds of pressure. The district will have to replace 1,600 feet of line in addition to the nearly 800 feet that it has already replaced. Dr. Fickenscher said that new plastic pipe is being used which "is not subject to the kind of corrosion" that originally caused the problem. He estimated that the job will be completed sometime next week. In the meantime, the school, which has been without gas service since the original leak was discovered, has had to do without hot water, and experiments in the science department have been curtailed. "So far, we have not needed the gas to heat the classrooms," said Saugus principal Dr. Myron Sprout. "But that can change at any moment." He said that the school would go to a "modified schedule," taking advantage of the warmer hours, should there be a severe change in the weather. News story courtesy of Tricia Lemon Putnam / Used by permission.